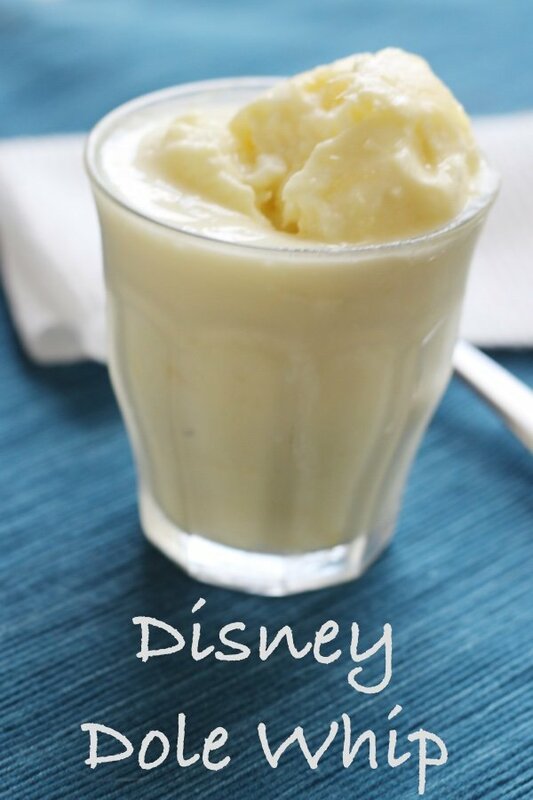 The big shock about this Disney Dole whip recipe is that it only contains 2 ingredients. You don’t have to fly to Orlando, book a resort, drag your children to Disney World simply to eat a Dole Whip. 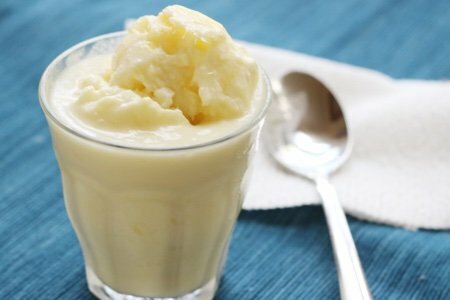 You can make one in your blender with frozen pineapple and coconut milk. I have just saved you approximately $4000. Please make checks payable to my children’s college fund. I have a couple of “only two ingredients” frozen desserts. Try my My two ingredient ice cream or my DIY strawberry frozen yogurt for a delicious healthy treat. This is basically a frozen pina colada without the rum. You can feel the warm Caribbean breezes as you drink this. The breeze is probably coming from your box fan in the window – but you can pretend you smell the salty air. If you do add the rum, be aware that this drink will become dangerous as you will find yourself back at the blender in no time. I’m not sure why Disney doesn’t add the rum. Hmmmm. In truth, my family had a wonderful time at Disney World. We visited Epcot and Animal Kingdom and it was as advertised – “the happiest place on earth”. My favorite ride was called “Everest” and featured a Yeti – I couldn’t stop laughing after the ride. Can I now say that I visited Nepal? Nahhh. Going to Disney world is like being in a giant movie set and you forget where you are (Florida), what time it is, and whether you actually will have to pay off the plastic after the trip by going back to work. My children demanded that each and every vacation from this point onward should be at Disney World. I wish I liked it that much. I prefer vacations that involve piles of books and a hammock so Disney doesn’t work for me. Have you been to Disney and tried the famous Dole Whip? If that doesn’t look easy, I don’t know what to say. I do have a high power blender that works well with frozen things. If you don’t have one, you could thaw the pineapple and then freeze the whole mix to eat later. 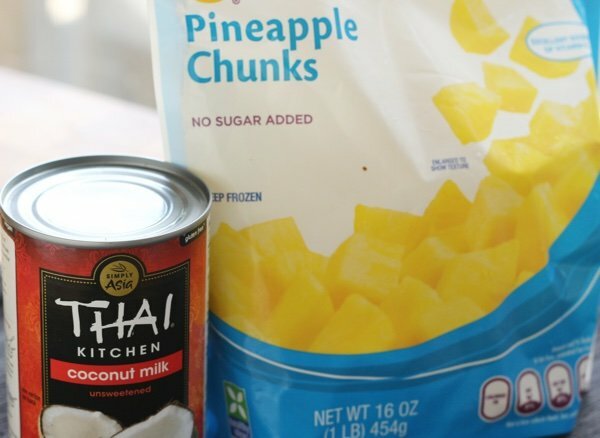 Blend pineapple and coconut milk in high power blender until smooth. Serve immediately. This looks scrumptious. I'm not too familiar with canned coconut milk, is it a full fat type with thick cream on top? If so, do you shake it first? I've only use boxed coconut milk from time to time. But I'd love to start keeping this in my pantry. Coconut ice cream bars are a favorite of mine and I can't wait to try this simple recipe! I just made this last night but used whole milk instead of coconut milk. It was delicious! I have also heard you can do the same thing with frozen berries. Yum!! You can buy some frozen pineapple which will make it a frozen drink. My kids loved Disney, too. It was a fabulous vacation....no arguing, patient in all the lines.everyone was happy all the time. But, wow...that trip needed so much planning! Quite daunting! After a crazy trip to Disney - long lines, sick kids - my kids have decided they prefer Aruba! (OK by me!) But, this looks scrumptious & far fewer points/calories than I imagined - thanks - will have to try. I so wanna make this; however, I am a bit confused about the coconut milk. Although I have the same brand that is shown in your picture, I have never used it. Do you shake it up before using or do you use just the cream found at the top of the can? Please help. Many thanks in advance. I calculated the Smart Points you say it's 4 SP my calculations put it at 9 SP although it may be tasty not worth 9 points. Wow - that's a LOT of sugar for ONE serving!!! Helene: Yes its 4.5 tsp! I hadn't noticed, and women's daily sugar intake is only 6 tsp as rec by AHA so this doesn't leave much room for the rest of the day. Hmmm I'm thinking using the boxed coconut milk with a couple drops of coconut extract might shave off 2 or 3 grams. We have been to Disney World many times. It is a magical place. That Foley Whip was amazing that hot day my daughter and I waited in line to get one. It was worth the wait. Now I have the recipe. Who'd thought just 2 ingredients! Thanks Snack Girl! @LaWanda - I mix the coconut milk in the can to blend it. I do not only use the cream. Great question! @Helene and @Carmen - the sugar is from the pineapple. I calculated the SP without the pineapple because I thought that you could leave it out. Please let me know if this is incorrect. THANKS! This looks so yummy! Isn't there a non-fat version of coconut milk that could be used instead to save on the WW SPs?